The Concat operator concatenates the output of multiple Observables so that they act like a single Observable, with all of the items emitted by the first Observable being emitted before any of the items emitted by the second Observable (and so forth, if there are more than two). 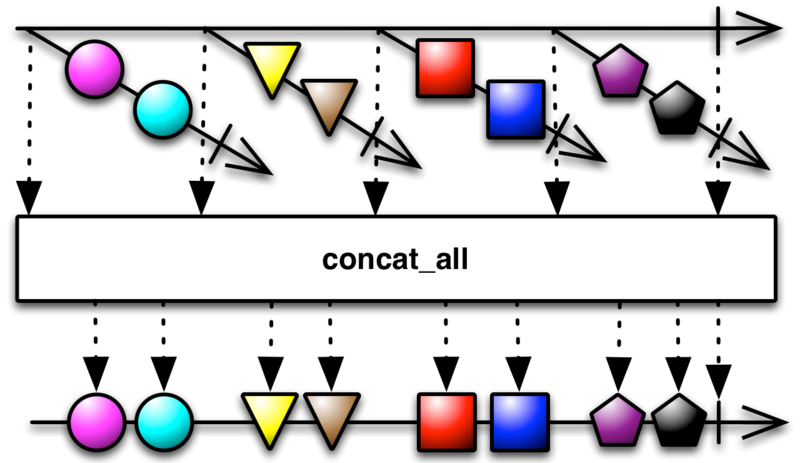 Concat waits to subscribe to each additional Observable that you pass to it until the previous Observable completes. Note that because of this, if you try to concatenate a “hot” Observable, that is, one that begins emitting items immediately and before it is subscribed to, Concat will not see, and therefore will not emit, any items that Observable emits before all previous Observables complete and Concat subscribes to the “hot” Observable. In some ReactiveX implementations there is also a ConcatMap operator (a.k.a. concat_all, concat_map, concatMapObserver, for, forIn/for_in, mapcat, selectConcat, or selectConcatObserver) that transforms the items emitted by a source Observable into corresponding Observables and then concatenates the items emitted by each of these Observables in the order in which they are observed and transformed. The StartWith operator is similar to Concat, but prepends, rather than appends, items or emissions of items to those emitted by a source Observable. The Merge operator is also similar. It combines the emissions of two or more Observables, but may interleave them, whereas Concat never interleaves the emissions from multiple Observables. In RxClojure concat concatenates some number of individual Observables together in the order in which they are given. The concat* operator concatenates the Observables emitted by an Observable together, in the order in which they are emitted. RxGroovy implements this operator as concat. There are variants of this operator that take between two and nine Observables as parameters, and that concatenate them in the order they appear in the parameter list. There is also a variant that takes as a parameter an Observable of Observables, and concatenates each of these Observables in the order that they are emitted. There is also an instance method, concatWith, such that Observable.concat(a,b) is equivalent to a.concatWith(b). RxJava implements this operator as concat. There are variants of this operator that take between two and nine Observables as parameters, and that concatenate them in the order they appear in the parameter list. There is also a variant that takes as a parameter an Observable of Observables, and concatenates each of these Observables in the order that they are emitted. RxJS implements this operator as concat and concatAll. concat takes a variable number of Observables (or Promises) as parameters (or a single array of Observables or Promises), and concatenates them in the order they appear in the parameter list (or array). It exists as both an Observable prototype method and as an instance method. concatAll is an instance method that operates on an Observable of Observables, concatinating each of these Observables in the order they are emitted. RxKotlin implements this operator as concat. There are variants of this operator that take between two and nine Observables as parameters, and that concatenate them in the order they appear in the parameter list. There is also a variant that takes as a parameter an Observable of Observables, and concatenates each of these Observables in the order that they are emitted. Rx.NET implements this operator as Concat. It accepts either an enumerable of Observables, an Observable of Observables, or two Observables as parameters, and concatenates these in the order given. RxPHP implements this operator as concat. Concatenate an observable sequence onto the end of the source observable. RxPHP also has an operator concatAll. Concatenates a sequence of observable sequences into a single observable sequence. In RxPY concat takes a variable number of Observables as parameters (or an array of Observables), and concatenates them in the order they appear in the parameter list (or array). 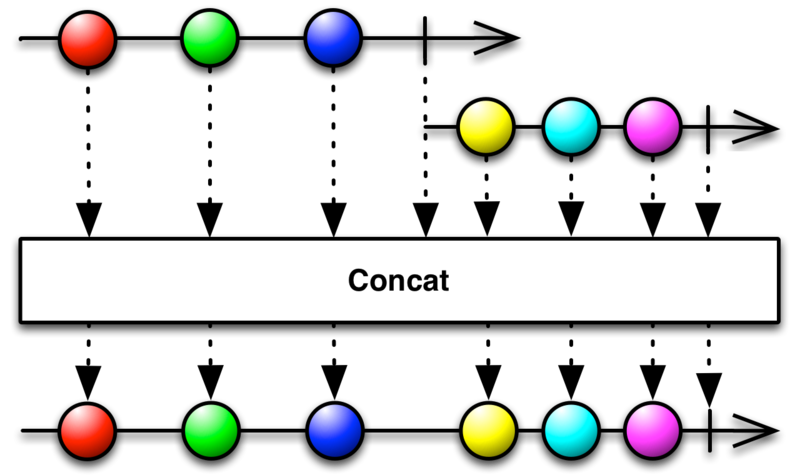 concatAll operates on an Observable of Observables, concatinating each of these Observables in the order they are emitted. In Rx.rb, the concat operator operates on two Observables as an instance operator, or on an array of Observables as a class method. The merge_all operator, despite its name, really behaves like a Concat variant in Rx.rb. It accepts an Observable of Observables as its parameter, and concatenates the emissions from these Observables. RxScala implements this operator in two ways. There is a concat operator that accepts an Observable of Observables as its parameter, and then concatenates each of these Observables in the order they are emitted. There is also a ++ operator that concatenates one Observable to another.